The rites of passage of Wicca are as unique as they are familiar. One of these rites is the marriage rite called a “Handfasting”. Although it can be legalized, the handfasting is seen as a spiritual union of two souls who have come together to walk and work together on their journey through this lifetime. One of the traditionally unique things about a Handfasting is that it is seen to last for a year and a day (unless you have legalized it). After that year and a day, your vows can be renewed for another year and a day or, in some traditions, for seven years. “Why is that?”, you may wonder. Belief that we can have more than one “soul mate” which we have chosen to do work with in this lifetime makes us realize that nothing is permanent. To pledge to be with each other for a year and a day, then deciding if you want to renew those vows, makes sense to those who hold these beliefs. Who do Wiccans recognize as being able to join together in this rite of Handfasting? Any two people, considered to be consenting adults, regardless of their gender. Why? Because although we may inhabit the body of a particular gender in this lifetime, the Soul is genderless and it is from the Soul that love springs. Think of it as a clothing choice. Does it matter if your marriage takes place in formal attire or in blue jeans and a t-shirt? You are still that same Soul, no matter what clothing you choose. You are also still that same Soul no matter what body gender you have chosen for this particular incarnation. Love sees no such boundaries. Why should we? The ceremony itself can be simple or elaborate. The choice rests with the couple being united. Many choose to have it performed outside in Nature for obvious reasons. The words spoken can be of an existing formal ritual or the couple may choose to write their own words. There can also be a combination of the two, which sometimes produces a very beautiful, personal rite. In some traditions, using a broom to sweep the negativity from the path of the newly united couple is used, with or without them jumping the broom as part of the rite. As you can see, there is a great deal of flexibility in the performing of the Handfasting rite and a lot of opportunity to be creative and to make it unique and personal. The rite itself can be performed by clergy (Priesthood) or the words may just be exchanged by the couple with witnesses present. It is here that I want to insert a personal perspective. As clergy, I want to know the couple I’m performing this rite for, at least to some degree. Unlike clergy from other faiths, I recognize that I am overseeing the creation of karma between two people. That, in my mind, makes me part of that karma. For that reason, I want to meet and speak with the two people I will be part of uniting. I want to know how they feel about taking this step. Why they feel they want to have this rite performed. What they see when they look at the future with each other. That may lead you to ask, have I ever turned down performing a Handfasting? Yes, I have. As a Witch and High Priestess, when something doesn’t feel right, I know I should withdraw and I have done so a couple of times. The couples still got handfasted, it just wasn’t by me. As I said, this is merely my perspective and I’m sure there are Wiccan clergy out there who would disagree with me on the subject. So what happens after that ‘year and a day’ if the couple decides they no longer wish to be together? Well, in many traditions, they just go their separate ways. No harm, no foul. In others, especially if one or both members want it, there is a rite called a “Hand-Parting.” Notice I said, “one or both members.” There have been times when just going your own way hasn’t been good enough. The need to break any karmic ties was felt necessary. Sometimes the couple, or even just one of them, has felt that a ritual started it, a ritual should end it. Call it a “Wiccan divorce”, if you will. Then a Hand-Parting ritual is performed. Like the Handfasting, it can be a traditional rite or one written by the departing couple. At the end, the couple turn away from each other and walk away in their own direction. If only one member wants this done, and the other member isn’t willing to participate, a surrogate can be chosen to stand in for the other person so that the rite can still be performed. 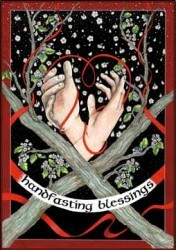 Whether you’re talking Handfasting or Hand-Parting, Wiccans do like to celebrate the occasion with friends and family. 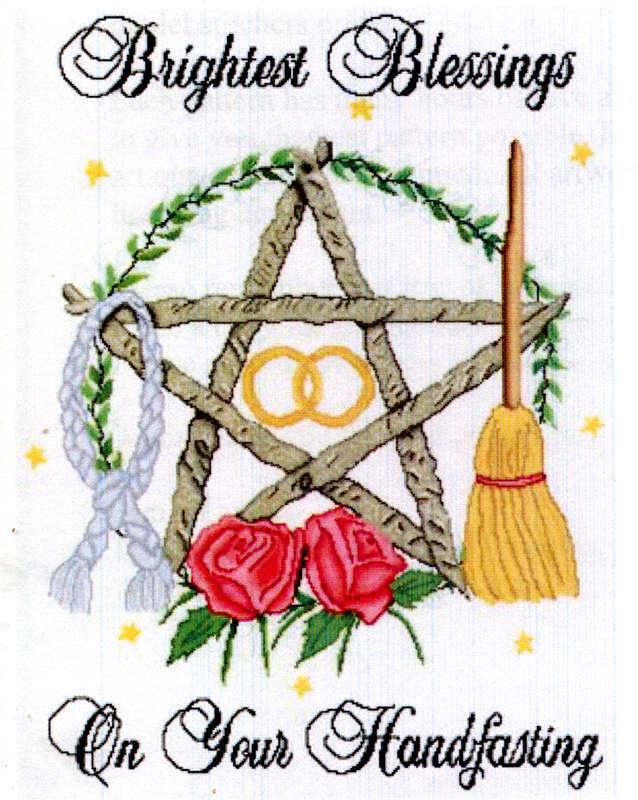 Whether celebrating the journey about to be taken by the united couple or the lessons learned and the new individual journeys about to be taken by the departing couple, to a Wiccan, it’s something to celebrate and recognize the blessings that have been bestowed by the occasion. In this day and age, where marriage is viewed as a legal basis for granting rites and privileges (insurance coverage, income tax classification, etc. ), the real basis for being united with someone gets lost sometimes. It was meant to be a uniting of two Souls, who recognize they have at least part of their Earthly journey to share with one another. Whether you are making that journey with someone right now, or still looking for your ‘traveling companion’, may you find peace, joy and love traveling with you now and always. This entry was posted in Metaphysics and tagged Divorce, Handfasting, Handparting, Marriage, Paganism, Rites of Passage, Sacred celebrations, Samantha Herron, Self-Empowerment, Spirituality, Wicca. Bookmark the permalink.